The world's largest software company, Microsoft, has unveiled a healthy rise in quarterly profits, and further cheered investors by announcing its first ever dividend payment. For the first time since Microsoft shares began trading on a stock market in 1986, shareholders will receive an annual dividend of 16 cents per share. However, the firm also cut its revenue targets, and as a result Microsoft's share price took a tumble in after hours trading. On Friday the share price dropped 4.5% within minutes of market open. The company also said that it planned a two-for-one stock split - which doubles the number of shares but halves the share price, making the stock potentially more attractive to small investors. Microsoft recently settled several long-running law suits after having been found guilty of abusing its monopoly status in the computer software market. Elsewhere, on a mixed night for US technology companies, profits were down at IBM but sales were up. IBM said its quarterly profit fell for the sixth quarter in a row, but sales of services and computer hardware rose. The computer services, hardware and software company said profits from continuing operations were $1.9bn, or $1.11 per share, down from $2.6bn in the same period last year. Continuing operations exclude IBM's hard disk drive business in which it sold a majority stake to Hitachi at the end of last year. 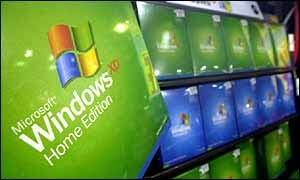 Microsoft outstripped its own and Wall Street's expectations as a new software licensing plan lifted profits. Microsoft reported a net profit of $2.55bn, or 47 cents per share, for the three months to 31 December, up from $2.28bn in the same period last year. Despite the strong results, Microsoft chief financial officer John Connors said the world's largest software company did not expect a significant upturn in global spending on information technology in the short term. As a result, shares of Microsoft tumbled to $53.83 in after-hours trade from $55.35 at the close. The decision to start paying a dividend represents Microsoft's transition from an archetypal "growth" company, which reinvests profits in development, to one which pays them to shareholders. It has been under pressure to split its $40bn cash pile with shareholders. Mr Connors said: "Declaring a dividend demonstrates the board's confidence in the company's long-term growth opportunities and financial strength. "We are especially pleased to be able to return profits to our shareholders, while maintaining our significant investment in research and development and satisfying our long-term capital requirements." Most technology firms in the United States have never paid dividends. Investors were happy to make gains through rising share prices, but with the technology sector in the throes of a recession and stock markets well below their highs, share holders are now expecting monetary rewards in return for their investment. "They are going to pay out about $1bn a year in dividends"
"It is quite a change in Microsoft strategy to pay a dividend"